Chime instruments have a superior quality wood base for a clear resonating tone. Chime bars are made from special aluminum alloy producing rich, long lasting sounds. Chimes are used for healing and meditation as they produce different vibrations and frequencies. which are the healing component of music, triggering alertness, concentration and deep relaxation. Educators can use Chimes to attract students' attention and to keep their classroom in order. Expand your musical talent by trying out different types of music on chimes. Enjoy the different uses the Zenergy percussion trio chimes instrument have to offer for you. 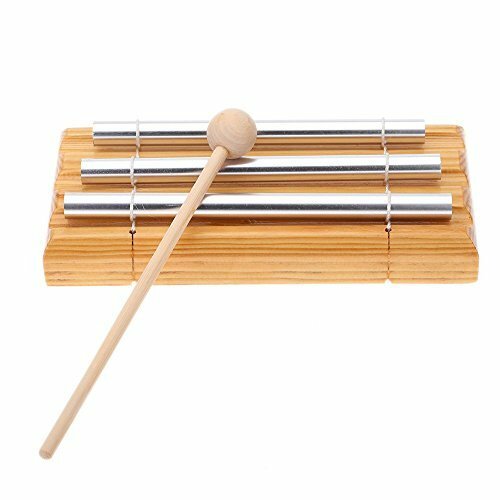 • This percussion trio chime instrument has three lasting tones that relaxes, soothes and reboots. • Incredible resonance helps to focus the mind in meditation and healing rituals. This chime is small enough to keep on a desk or by the bed for your convenience. • Help your child develop musical sense through this fun and easy to use Zenergy percussion trio chime instrument. Perfect for gift; not too bulky or expensive. • Attention teachers and child caregivers: Keep your classroom in order by attracting your students' attention using the Zenergy percussion trio chime instrument. • This chime consists of three polished aluminum rods of different lengths fastened to a high quality wooden base and striking mallet. Exquisite and Durable. If you have any questions about this product by Musical Concepts, contact us by completing and submitting the form below. If you are looking for a specif part number, please include it with your message.